The Chalice is the large Eucharistic cup in which the wine for consecration is placed. Regarding its shape, no precise rules are laid down, but custom would have it somewhat resemble the open calyx of a lily. In ancient times it was formed so as to resemble an apple, and this with a view to remind us that it is through the merits of Christ’s Precious Blood, which the Chalice contains, that the sin of Adam, in eating the forbidden fruit, was atoned for. Many liturgical writers tell us that the Chalice which our Divine Lord used at the Last Supper was made after the manner of the Roman cantharus, or mug—that is, with a handle on each side by which to lift it; and that its capacity was a sextary, or about a pint and a half (Bona, Rer. Liturg., 290; see also the Revelations of Anne Catherine Emmerich). According to the testimony of Bede, quoted by Baronius (Anno 34, No. 63), this Chalice was made of silver, and was preserved for a long time at Jerusalem, where the people used to offer it much veneration. All this, however, or at least the main part of it, is contradicted by the gravest liturgical writers, and very justly; for it is now pretty well known that the Bede who fabricated the story was not the Anglican Bede called the Venerable, but a certain person of the name of Adamnamus Scotus, whose reputation for telling the truth did not stand very high (Kozma, Liturg. Sacr. Cathol., p. 82, note). The great majority are in favor of saying that the Chalice our Lord used was made of agate, and that by some means or other it came into the possession of the people of Valentia, who now preserve it with jealous care (Gavantus, Thesaur. Sacr. Rit., p. 124). St. Cæsar, Bishop of Arles, in France, used a glass Chalice frequently. And St. Gregory of Tours tells us of one that he himself used, and how when it was broken by accident he had it restored through the intercession of St. Lawrence (Bona, 290). It must be observed, however, that the use of glass Chalices was never general in the Church, and that whenever they were used at all it was from pressing necessity. That Chalices of stone and marble were used at one time, at least on some pressing occasions, we see from the life of St. Theodore, Archimandrite, commonly known as “Theodore of the Studium,” from the great abbey of that name at Constantinople, where it is said that, when this holy man had enlarged his monastery, he changed his sacred vessels of marble for those of silver (Bona, ibid. ; see also the saint’s life). It was customary, too, in some churches to use Chalices of precious stones—of onyx, sardonyx, chrysolite, etc.—also of horn and ivory. Among the ornaments donated by Pope Victor III. (eleventh century) to the famous monastery of Monte Casino, two Chalices of onyx are enumerated (ibid.) We find Chalices of horn prohibited as early as the eighth century in the Synod of Calcuith, in England (ibid.) In 813 the Council of Rheims decreed that both the Chalice and Paten should be of gold, or at least of silver. In case of great poverty it allowed a Chalice of pewter. It strictly forbade, however, no matter what the necessity, to consecrate in one made of wood or glass (Kozma, 83, note). 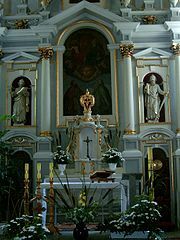 Ornamentation of Chalices.—From the great respect that the Christians of early times manifested for anything concerning our Divine Lord much care used to be bestowed and much artistic skill displayed in the ornamentation of Chalices. The devices were, as a rule, taken from some incident connected with our Saviour’s life upon earth, such as the raising of Lazarus from the dead; changing the water into wine at Cana; multiplying the loaves; bringing back the “lost sheep”; healing the sick or consoling the afflicted. The bottom of a glass Chalice found in the Catacombs, and mentioned by Father Northcote in his work on the Roman Catacombs, represents four different scenes taken from Scripture: first, Tobias and the fish; second, our Lord healing the paralytic; third, the children in the fiery furnace; fourth, the changing of water into wine at Cana. Another, taken from the same work, has enamelled figures of the Blessed Virgin and of the Apostles SS. Peter and Paul. Baptismal Chalices.—These were used solely for communicating children after they had been baptized—a custom which once prevailed in the Church of the West, and is yet in vogue in the Eastern Church. Silver Tubes attached to Ancient Chalices.—The first Roman Ordo, in laying down the rules that regard the distribution of the Precious Blood, says that, after the Pope and his ministers had taken their portion from the Chalice employed at the altar, the remainder was to be poured into a large cup (scyphus) and dispensed to the people through a reed or tube (Church of Our Fathers, vol. i. 164). In Masses celebrated by an ordinary priest the deacon used to pour unconsecrated wine first into the Chalice intended for the people before he poured the Precious Blood, and then “confirm” all, as the saying went—that is, allow each to taste of the Blood thus mingled through a reed made of gold, silver, ivory, or glass, as the case might be (ibid., note 35). Up to a very recent date the silver tube was employed in the Monastery of Cluny, and at that of St. Denis in Paris, on Sundays and Holydays (ibid.) Kozma (p. 84) would lead us to infer—in fact, he asserts it—that this ancient custom is yet kept up in the Monastery of St. Dionysius, of the Congregation of St. Maur, near Paris, where, by a special indult of the Holy See, the deacon and subdeacon, at Solemn High Mass, yet communicate under both kinds. With this exception the ancient practice is now seen nowhere else unless in Solemn Mass celebrated by the Pope, where his Holiness always receives the Chalice through one of the forementioned reeds. The deacon assisting him on such occasions receives the Precious Blood through the reed also, but the subdeacon receives it from the Chalice itself (Kozma, 84, note 13). For purifying these reeds a long golden needle used to be employed after they had first been rinsed with wine and water. Dr. Rock, in his very valuable work, The Church of Our Fathers, vol. i. p. 167, exhibits one of these needles having a head of sapphire. The papal needle depicted in the same place has two chain ornaments at its head, in which the pontiff is expected to put his fingers when receiving the Precious Blood. Before we dismiss our subject we must not forget to mention that, no matter how numerous the communicants were when the discipline of receiving under both species prevailed, there was but one Chalice used at the altar in the act of consecrating. Pope Gregory II., A.D. 726, having been asked by St. Boniface if it were lawful to employ any more than one, thus replied: “In the celebration of Mass that must be observed which Our Lord Jesus Christ observed with his disciples; for he took the Chalice, saying, ‘This is the Chalice of the New Testament in my Blood; this do as often as you shall receive.’ Whence it is not fitting to place two or three Chalices on the altar at the celebration of Mass” (Church of Our Fathers, i. 165, note). Chalices of the Orientals.—The extraordinary respect shown by all the Orientals, schismatic as well as orthodox, for the sacred vessels concerned immediately with the Blessed Sacrament is worthy of all commendation. The Copts will allow nothing to enter into the composition of the Chalice but the most precious material; and notwithstanding their almost universal poverty as a people, yet care is always taken to see that their Chalices are of the purest silver or gold (Renaudot, Liturg. Orient. Collect., comment. ad Liturg. Copt. S. Basilii, vol. i. p. 175). Regarding the consecration of the Chalice the majority of the Orientals are not particular. But this is not through any carelessness whatever or disrespect on their part; if anything, it is a mark of the lively faith they have in the real presence of our Divine Lord in the Blessed Sacrament, and of their belief in the virtue that accompanies this Sacred Presence everywhere. Their reasons for not paying more attention to the consecration of their Chalices is that to their minds the simple contact of the Precious Blood is sufficient itself to consecrate them without any additional ceremony. In proof of this belief many examples of a miraculous nature are cited. The Copts, for instance, have it on record in the patriarchal history of Alexandria that when one of their Chalices was stolen by the Mahometans and sold to an artisan, the latter observed blood flowing from it the moment he broke it. Another story is related in a history of the Nestorians, to the effect that a man who had been almost crushed to death by the falling of a wall was instantly restored to health and strength by drinking the water which was poured out of a Chalice. Many other miracles are cited, but those given we deem enough at present. Nor was the belief that the Chalice is consecrated by contact with the Precious Blood solely confined to the Orientals; some very able theologians of the Latin Church, and Diana among others, held the same belief also (Renaudot, ibid. ; Merati, Thesaur. Sacr. Rit., 126). But the practice of our Church has always been to consecrate in every case, irrespective of what theologians or others say upon the subject. It must be observed, however, that although many of the Orientals do not consecrate their Chalices, yet there is a form for so doing in all their rituals. According to the Coptic Ritual, the form runs as follows: “O Lord Jesus Christ, God and man together, whose divinity and humanity are inseparable, who didst by thine own free-will pour out thy blood for the sake of thy creatures, stretch thy divine hand over this Chalice, sanctify and purify it, to the end that the same Precious Blood may be borne in it as a remedy and pardon for all who truly partake of it.” The Chalice is then anointed within and without with holy chrism, whilst the following words are said: “Sanctity, purity, benediction, and protection to all who drink of thy true and precious blood. Amen.” According to the Greek Ritual, given by Goar (Euchology, p. 853), the ceremony of consecration is almost the same.